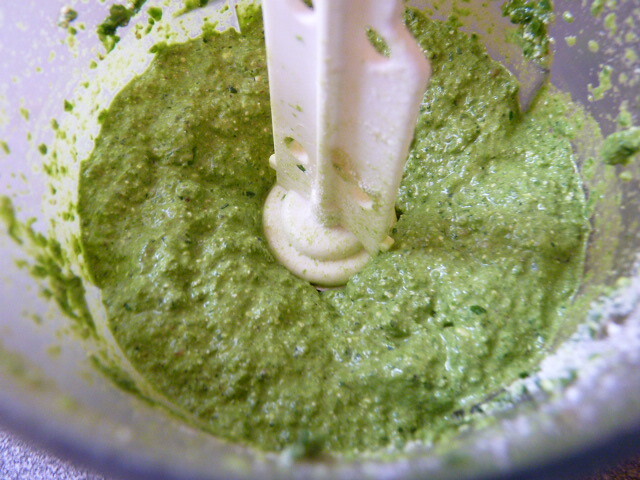 This is a very quick and frugal recipe that I had never seen before moving to Greece. The exact recipe here is my invention, but it’s based on an international recipe, that for some reason is not popular in the US, at least not where I’ve lived. So I thought I’d share it with you. 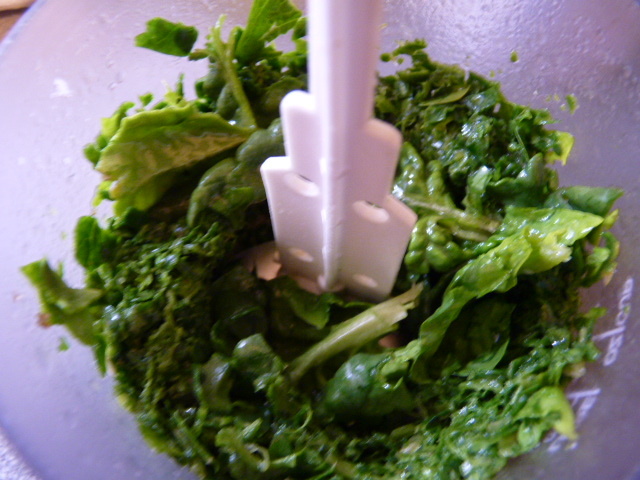 It fulfills my most important requirements: cheap, made with ingredients that are easy to get, and reasonably healthy. 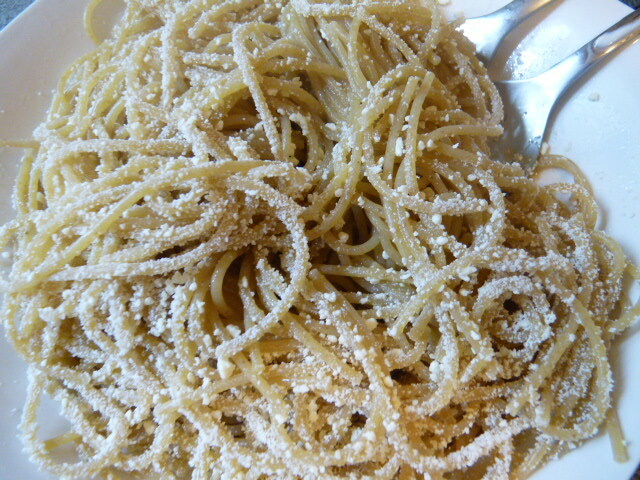 I strongly recommend whole wheat spaghettini or spaghetti for this, rather than white pasta. 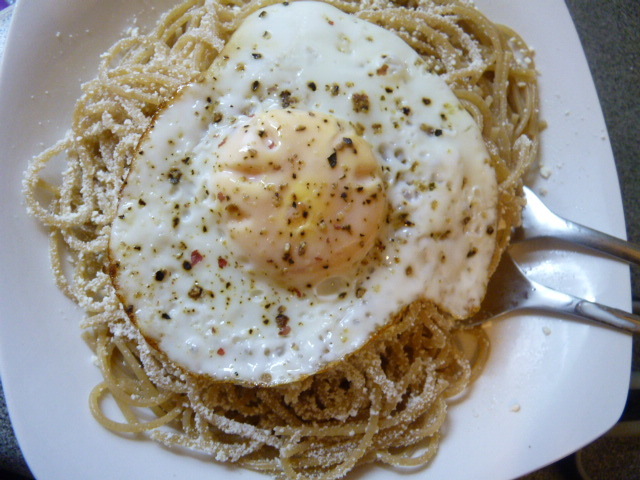 The whole wheat pasta stands up much better to the egg yolk. One egg per person. 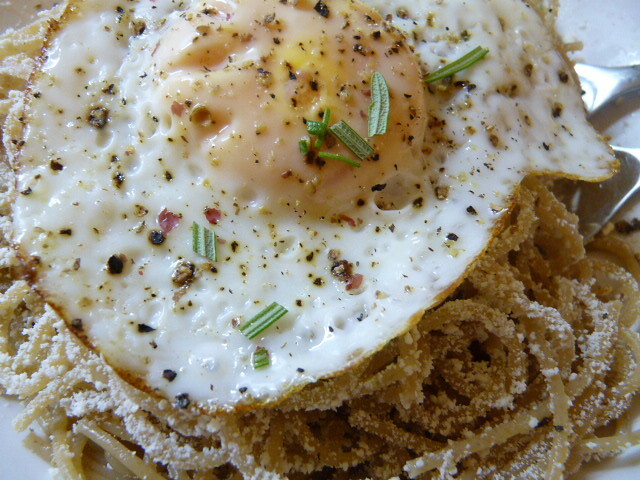 I usually use small eggs, and those are fine; however we were given some large eggs as a gift so I used those for this recipe. 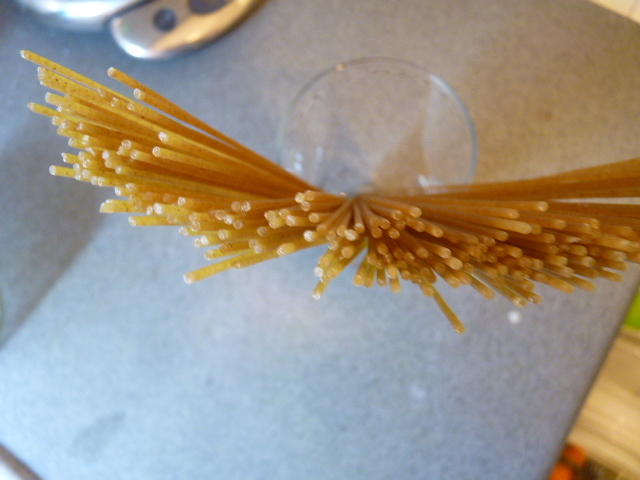 Boil the spaghetti al dente in lightly salted water. 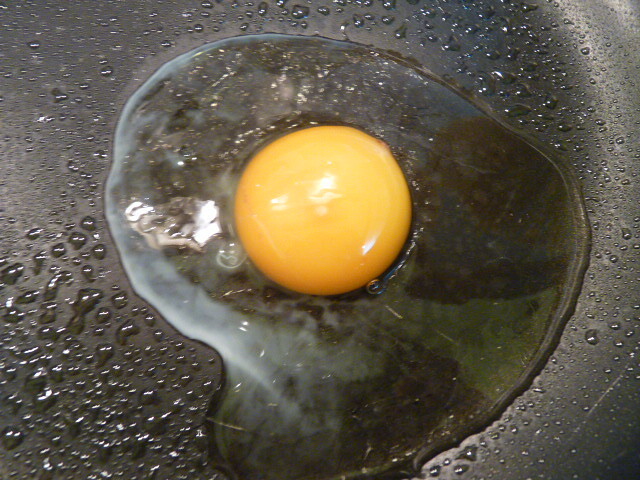 While the pasta is boiling, spray a nonstick pan with olive oil and, on medium heat, cook the egg. 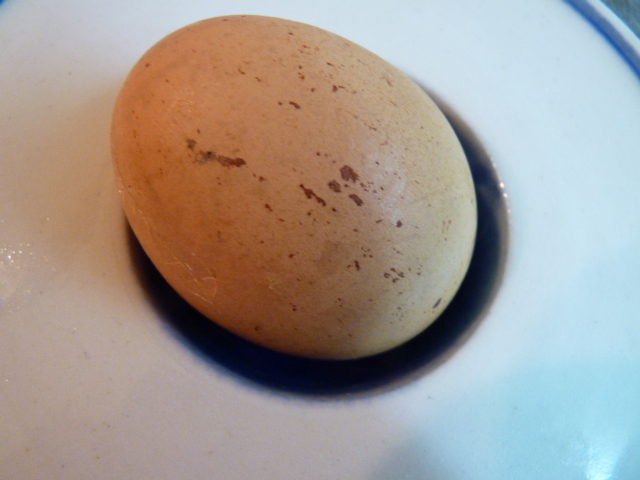 Season the egg with salt and pepper before the white sets. 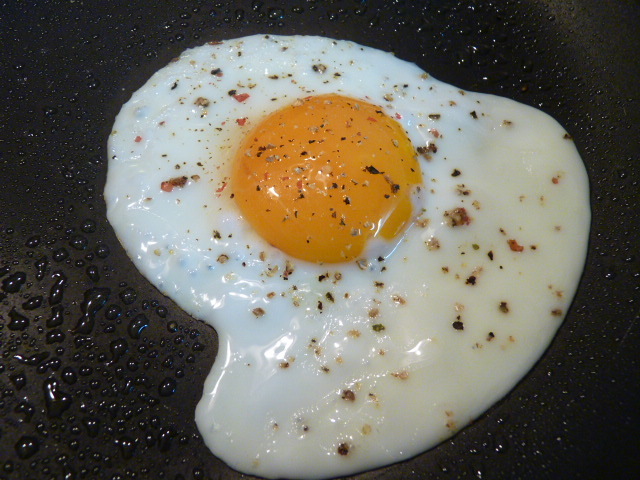 To “fry” an egg without oil and without flipping it over, when the white is cooked on the bottom but still raw on top, cover the pan for a minute until the white on top sets also, but the yolk is still runny. Drain the pasta. 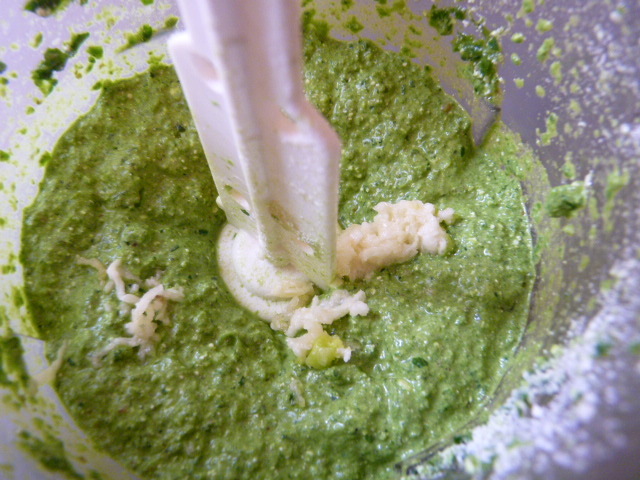 Stir in a tablespoon of garlic olive oil (I make garlic olive oil with hot Thai peppers and a few other whole spices – this works perfectly here) and a tablespoon of shredded hard cheese (parmesan, myzithra, romano, etc.). 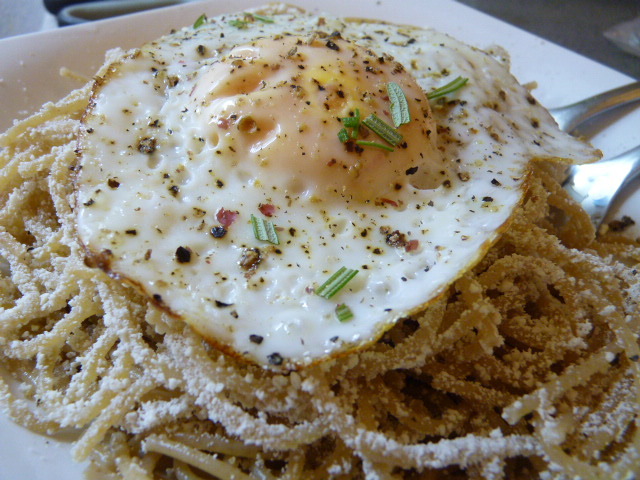 Simply place the egg on top of the pasta. Sprinkle with fresh rosemary if available. 1. 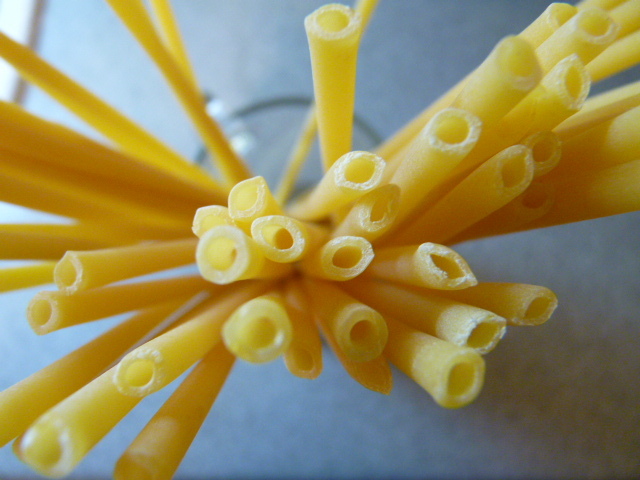 Boil pasta al dente in salted water. Drain. 2. 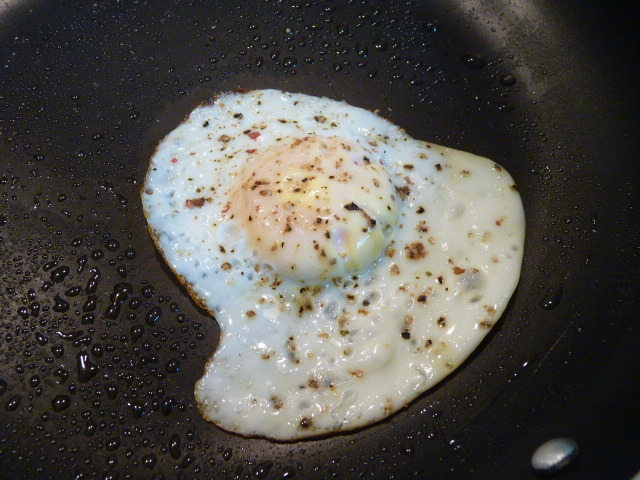 “Fry” eggs in nonstick pan lightly sprayed with olive oil. Season with salt and pepper. 3. 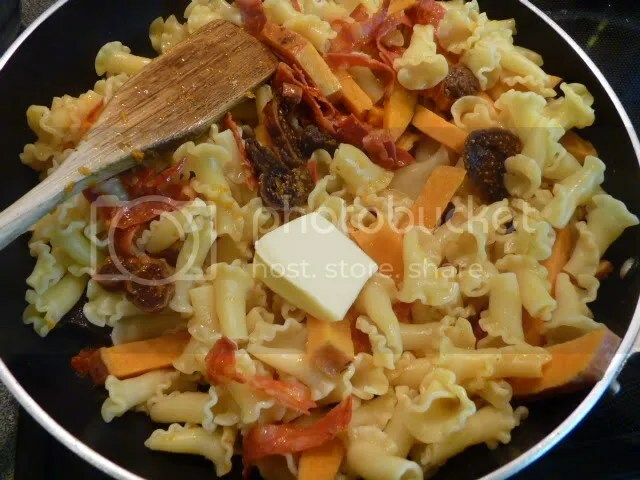 Toss pasta with olive oil and cheese. Divide into two plates. Top each plate with an egg, and sprinkle with rosemary. When I was a fresh-faced college junior, I spent a semester studying in Athens (one of the best times in my life, and which helped seal the deal on me settling here eventually). 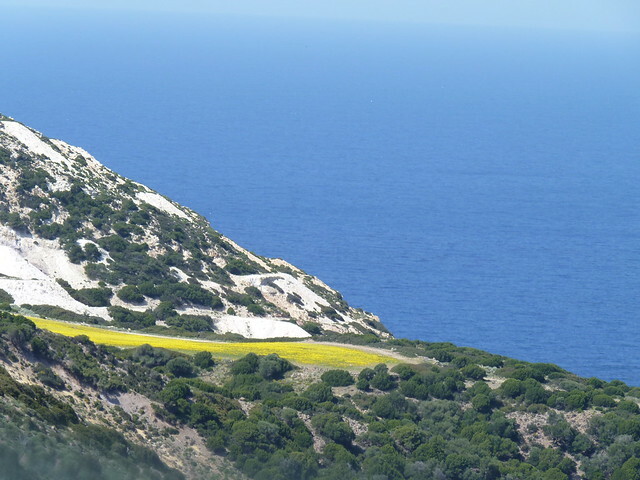 That year for Carnival (Mardi Gras), I traveled to the island of Corfu (Kerkyra in Greek). 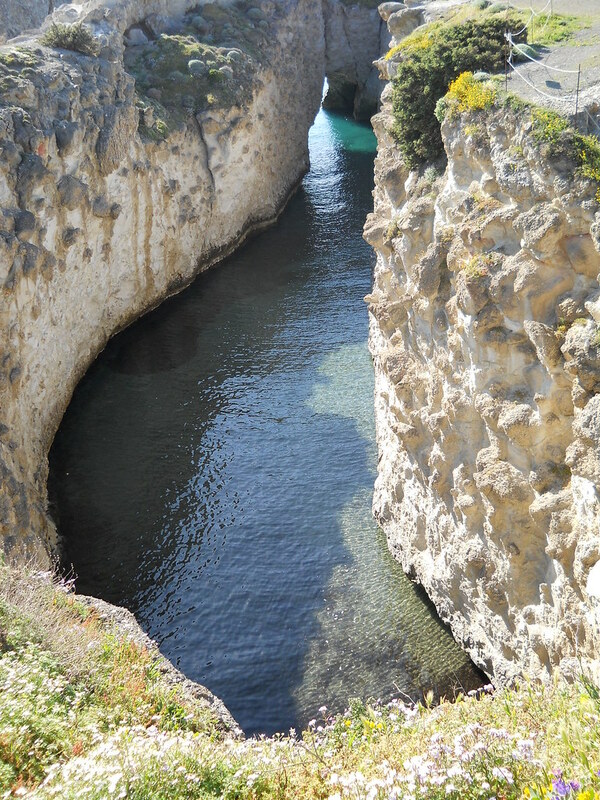 I had a great time exploring the beautiful city of Kerkyra and the rest of the island. Little did I know that S – as yet undiscovered by me – was living about a block from where I was out dancing in the streets with my feathery mask. 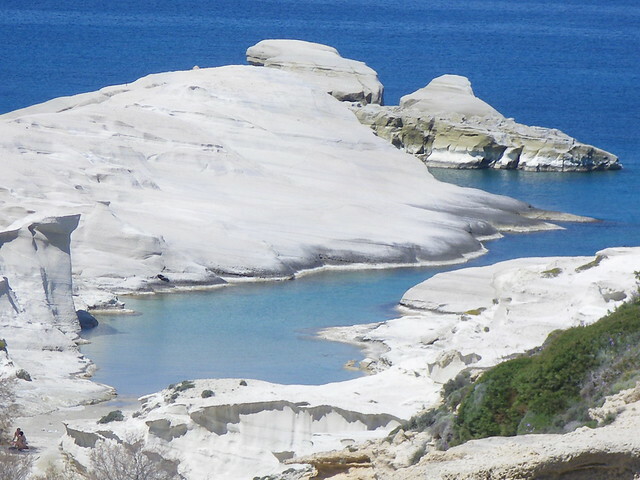 S lived in Corfu for seven years, and it remains one of his favorite places in Greece. 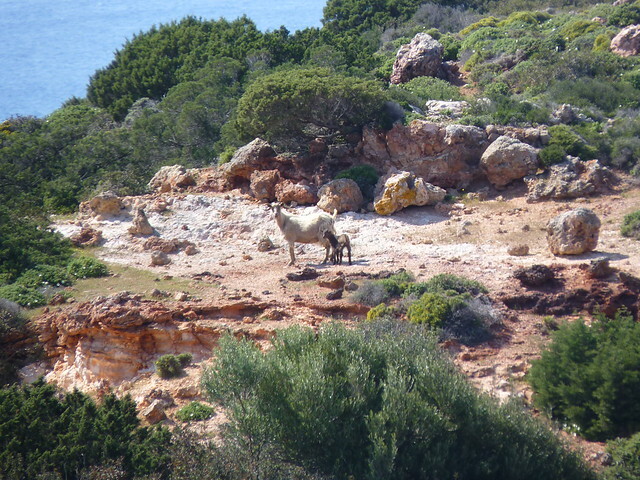 When we first met, we dreamed of moving to Corfu some day. We haven’t ruled it out, but we are taking a break from the islands to enjoy the easier lifestyle of the mainland. 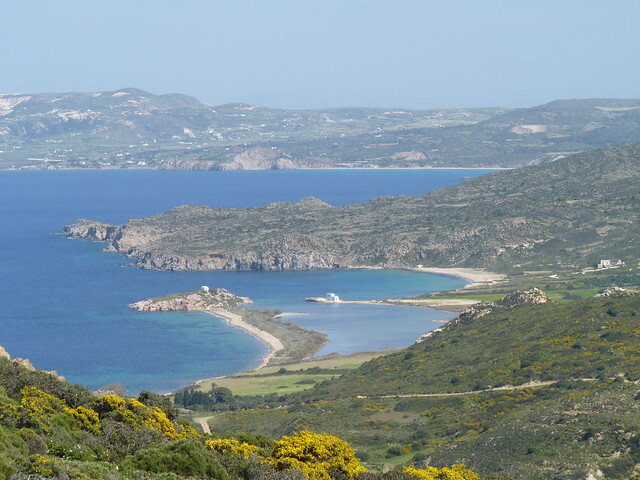 But he still longs for Corfu, and when we visited the island together as a married couple, he seemed intent on taking me to at least twenty restaurants in only three (cold, overcast) days. Corfiot cuisine is heavily influenced by Italian, French, and British cuisine, but it retains its Greek nature and this is what makes Corfiot food so unique. 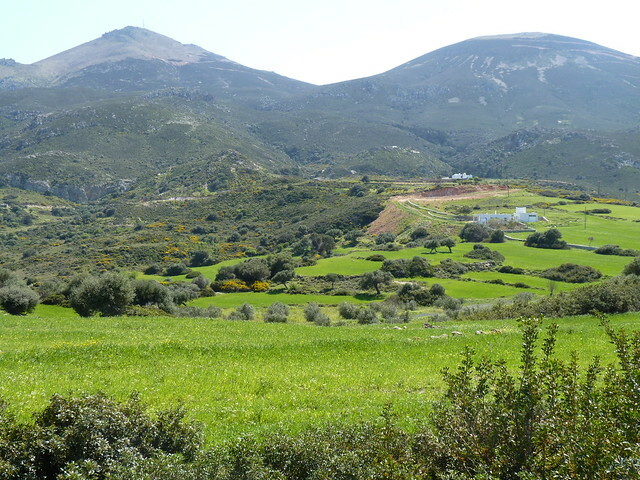 They tend to use more spices, and to use different spice combinations, than we find in the rest of Greece. 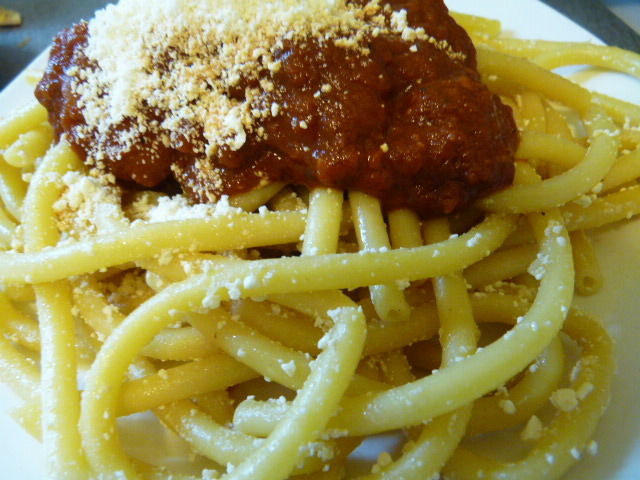 One of the dishes that S really liked was pastitsada, which is basically rooster baked in a spiced tomato sauce, over pastitsada noodles – long thick spaghetti noodles with a hole through the center. 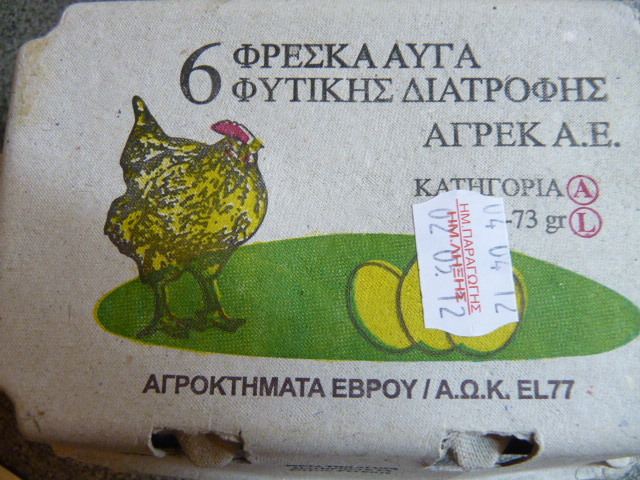 Instead of rooster, veal or chicken are sometimes used. 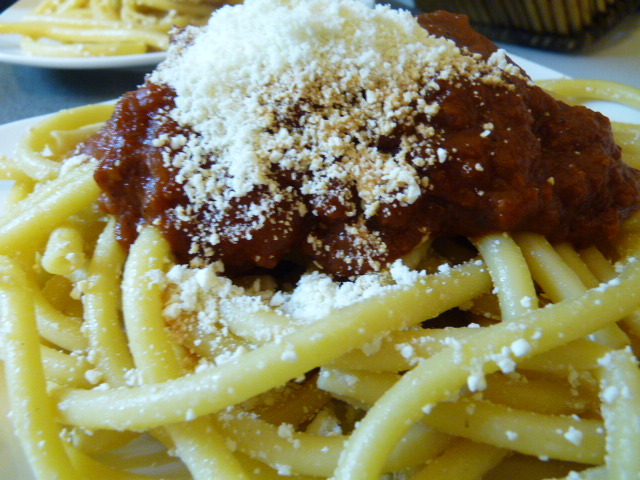 That’s all a bit rich for us, so I wanted to see if I could just make the sauce and serve it over the pastitsada noodles for a frugal crisis-appropriate version. I didn’t have really high hopes for this one, but I figured if the end result was a nice, slightly different, red sauce for pasta, that would be just fine. As it turned out, we loved it – the earthy flavors had enough character that we didn’t even miss the meat. 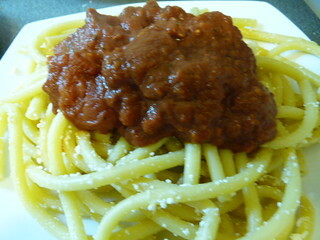 So if you’re looking for a new twist on the classic spaghetti with tomato sauce, give it a try. And then we had a lovely meal, where we talked about Corfu and the other islands in the Ionian Island archipelago. I’m so happy that this simple sauce brought back so many lovely memories of his favorite island. 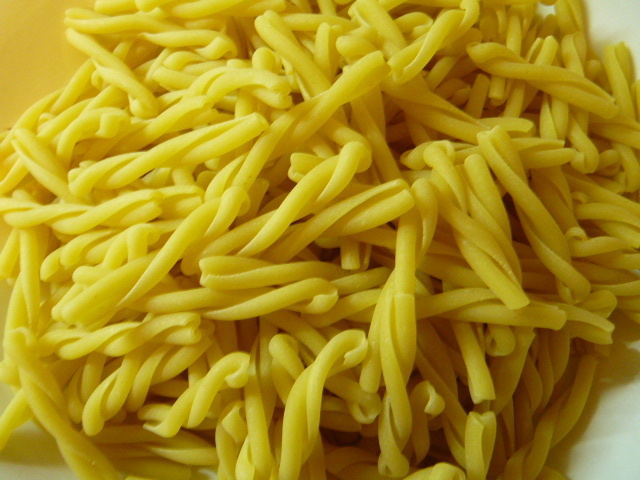 The pastitsada noodles are sold by Misko in the Traditional line in Greece. 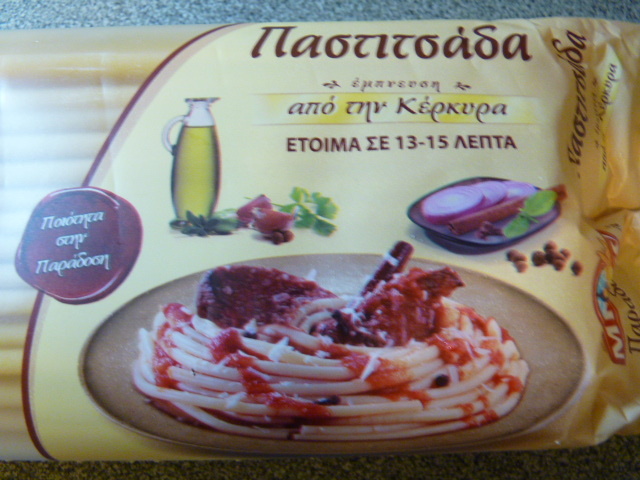 They’re almost the same as regular pastitsio noodles (spaghetti no. 10). Cut the tomatoes in half or quarters depending on their size. 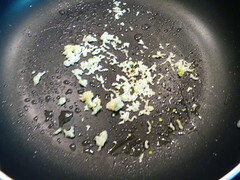 Saute the garlic in a little olive oil. 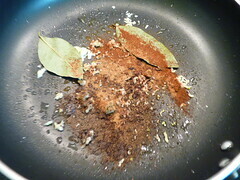 Add the spices and the bay leaves and let them toast together. Stir in the tomatoes and the sauce they’re packed in. 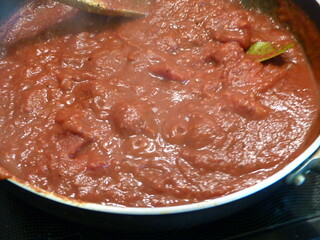 (If your tomatoes come in a watery sauce more like tomato juice than tomato sauce, add 1-2 tbsp tomato paste to the recipe.) 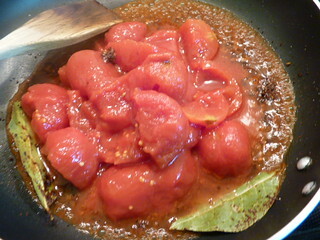 My tomatoes come with a lot of sauce, which I won’t use all of in the dish, but I cook it all together anyway. Let it simmer. Add the wine. Let it simmer. Melt some butter in the pasta pot over low heat. 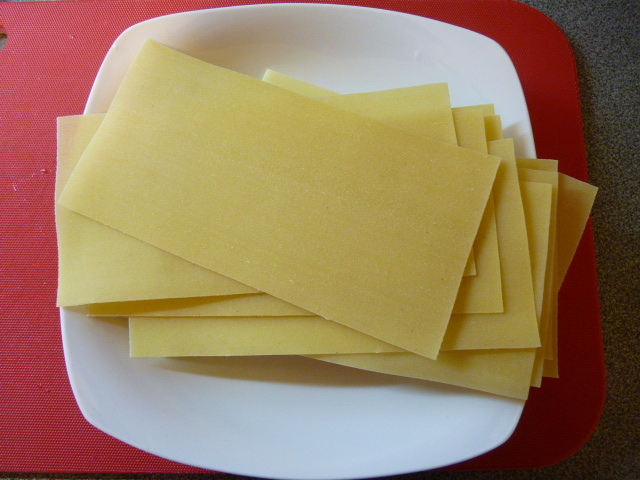 Add the drained pasta and half the cheese and stir vigorously to prevent sticking. Put the tomatoes on the pasta, with a little sauce. 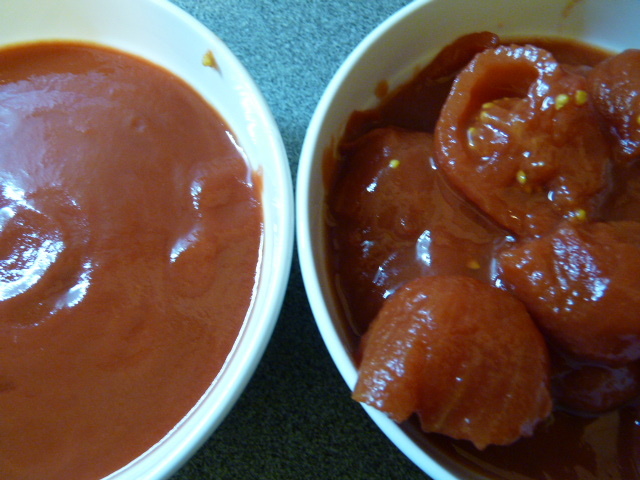 If your tomatoes had a lot of sauce with them like mine, the extra sauce can be used in another recipe (it would be really good in tomato soup). Note to post skimmers: real pastitsada has rooster meat and is baked in the oven. This is the frugal and quick version that I made up and I’m not claiming it’s ‘authentic’ in any way! 1. 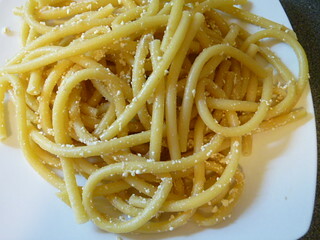 Boil the pasta al dente in a large pot of salted water. Strain, set aside. Quarter each of the tomatoes (or halve, if they’re small); reserve the liquid. 2. Make the sauce while the pasta is boiling. Spray or drizzle a skillet with olive oil and heat over medium heat. 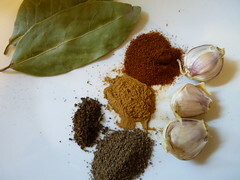 Add the crushed garlic with the spices (bay leaves, cinnamon, allspice, cloves, and paprika). Stir for two minutes until the spices are fragrant. 3. 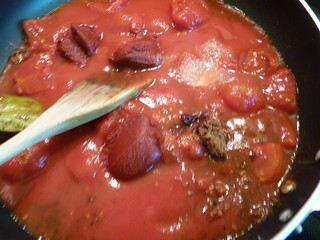 Add in the quartered tomatoes (with their liquid), the tomato paste, the sugar, and the salt. Stir and let simmer for about 5 minutes until it thickens. 4. Stir in the red wine and simmer for about 15-20 more minutes, allowing it to thicken up again. 5. 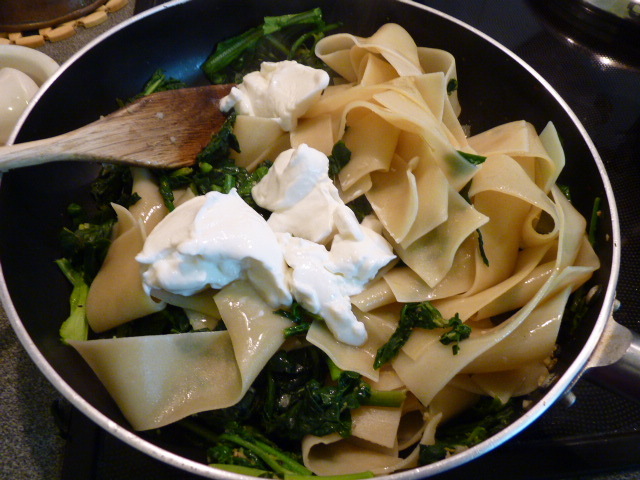 Put the butter in the now-empty pasta pot and warm over low heat. 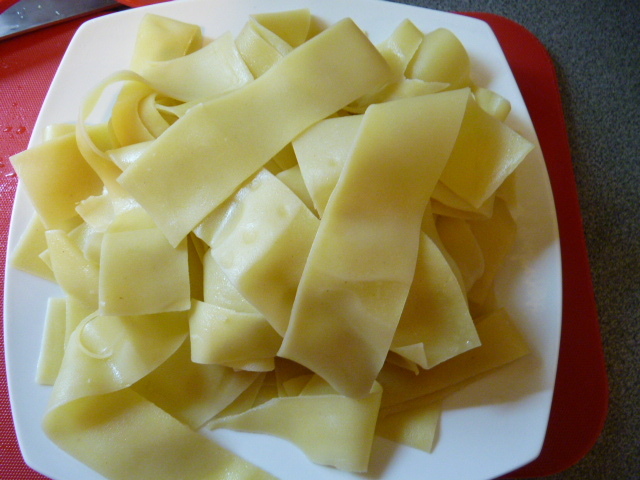 When it melts and starts to turn a golden-brown color, add the drained pasta and stir in 2 tbsp of cheese. 6. When the cheese has melted, divide the pasta into bowls. 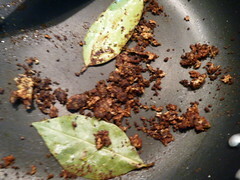 Remove the bay leaves from the sauce. 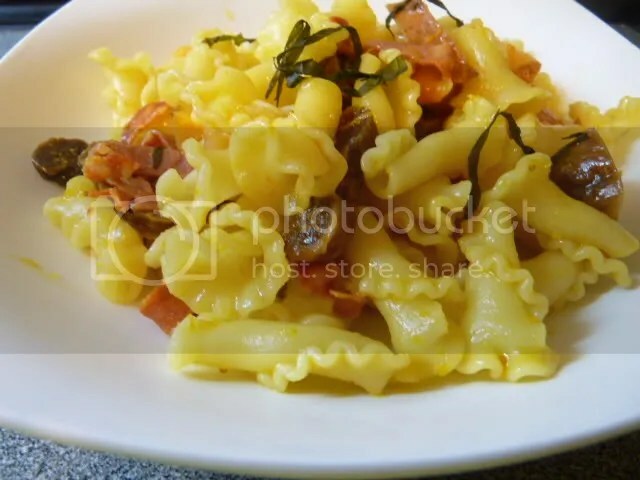 Top pasta with the tomato quarters and a few tablespoons of the tomato sauce, and the remaining cheese. 1,727mg sodium (72% DV) – note: this assumes salted tomatoes, I used sodium free. 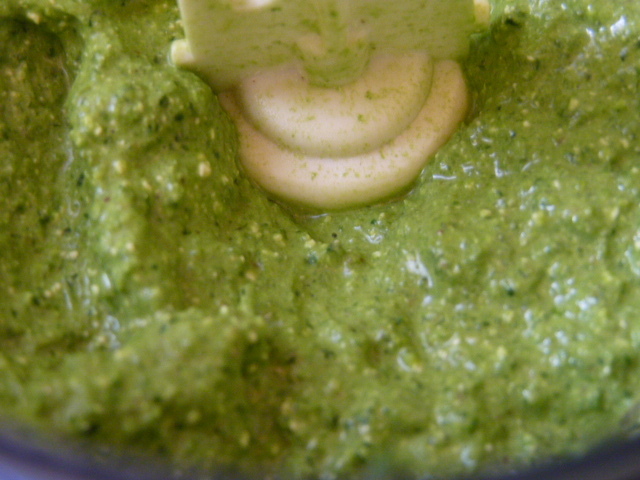 Pesto is pretty popular in our house. 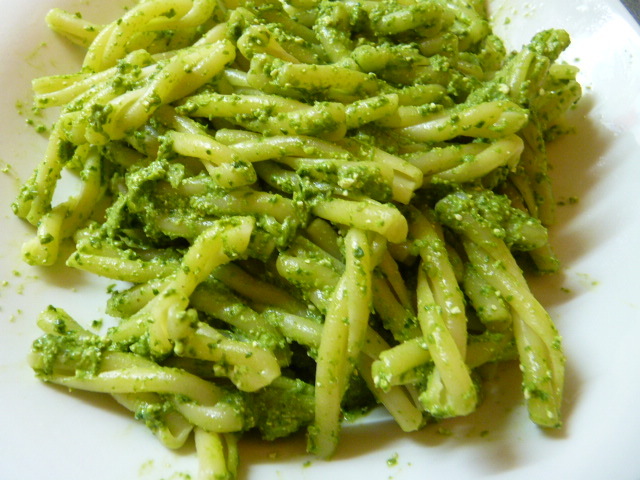 There’s something very satisfying about a plate of pasta with pesto. 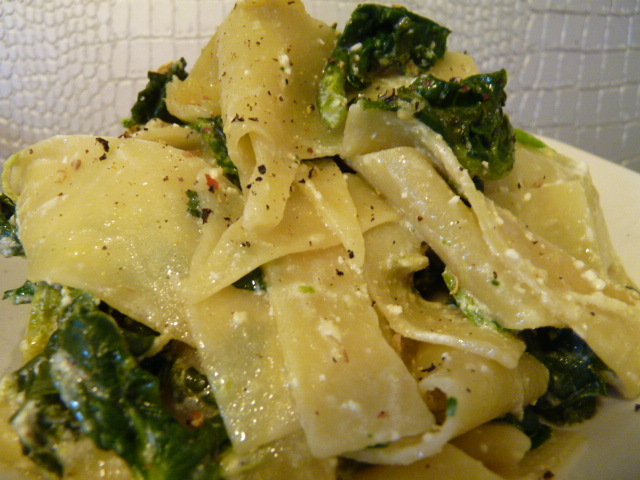 My favorite pestos are the ones that have depth of flavor, that are not just oily basil goop. 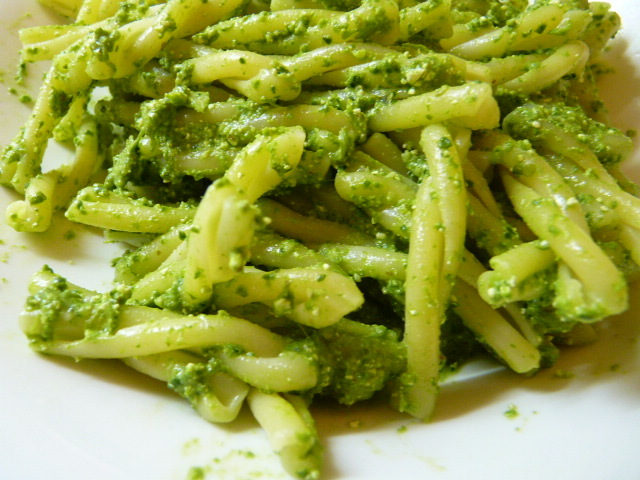 This is a bright and cheery pesto that comes together well before the pasta has boiled, from a few simple ingredients. Start by putting your water on to boil for your pasta. You can use any pasta shape you like. I went with the braided pasta plexoudes because I love it. 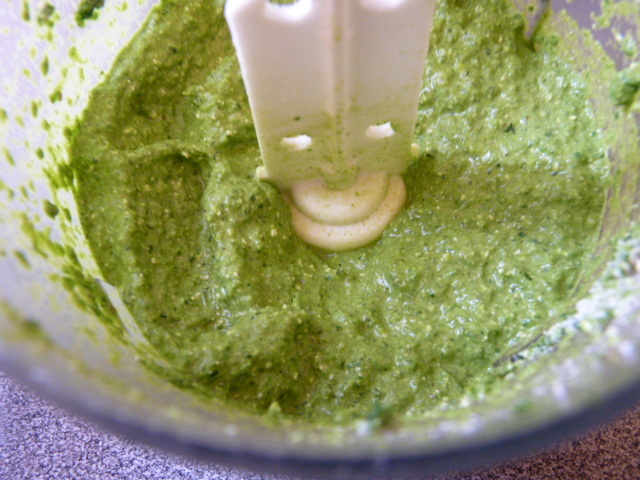 Fresh spinach and arugula form the base of this pesto, in a 4:1 ratio. Frozen won’t work here. 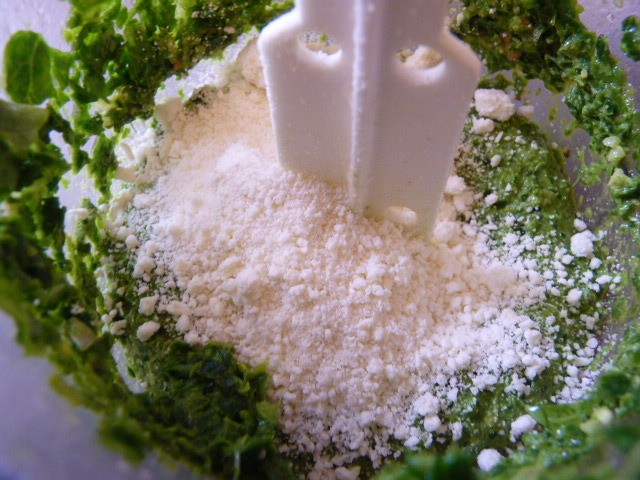 Put half of your cleaned and stemmed spinach and arugula into a food processor with 1 tbsp olive oil. Process. 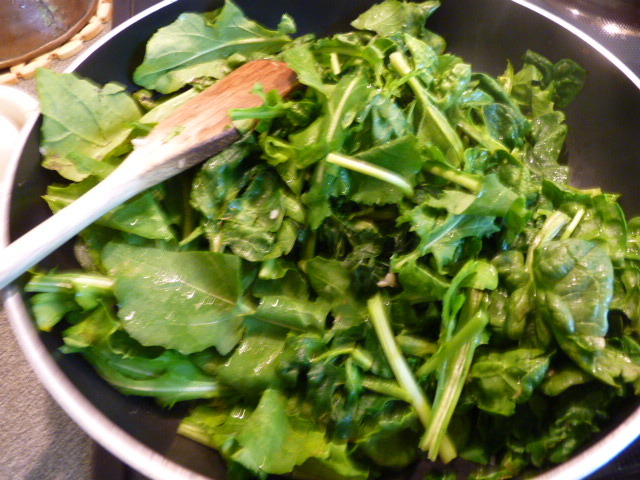 Add the rest of the spinach and arugula with another tbsp of olive oil. Process. 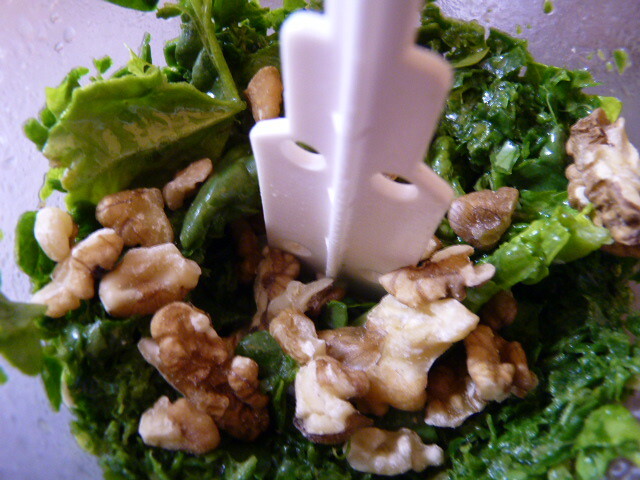 Add the walnuts with another tbsp of olive oil. Process. Add the myzithra or parmesan. Process again. 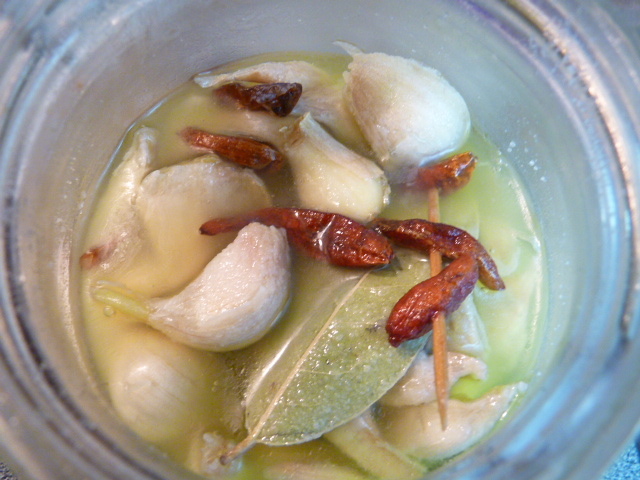 Add garlic to taste – because the garlic is raw, I just used one clove, and process a final time. 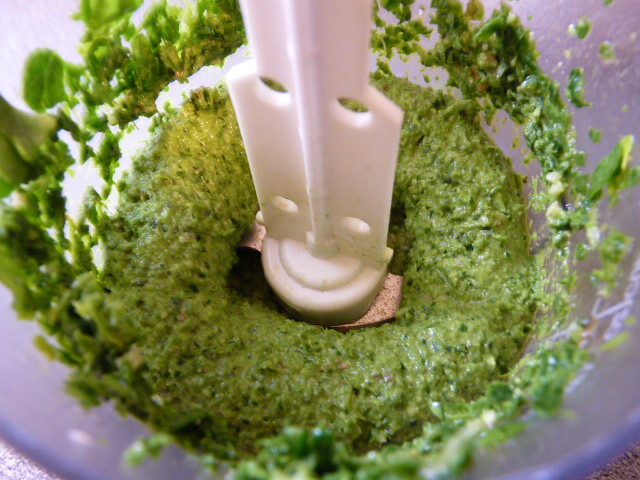 Your pesto is ready! 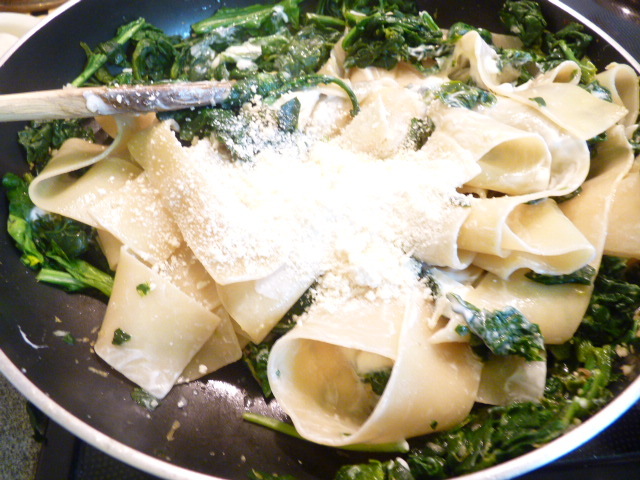 Two tablespoons per plate of pasta is a generous amount. 1. 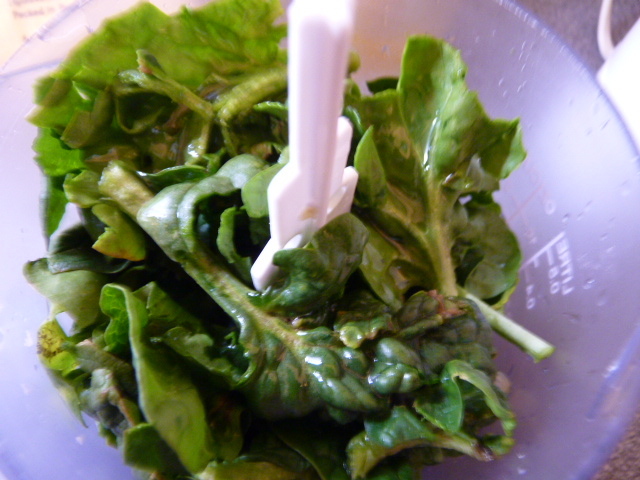 Process the spinach and arugula with 2 tbsp olive oil in a food processor; do in several batches if necessary. 2. Add walnuts with last tbsp olive oil; process. Add cheese; process. Add garlic; process. 3. 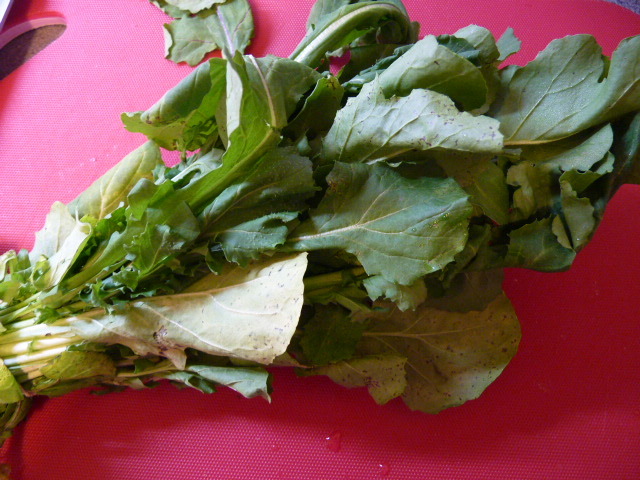 Serve with pasta, potatoes, chicken, etc. 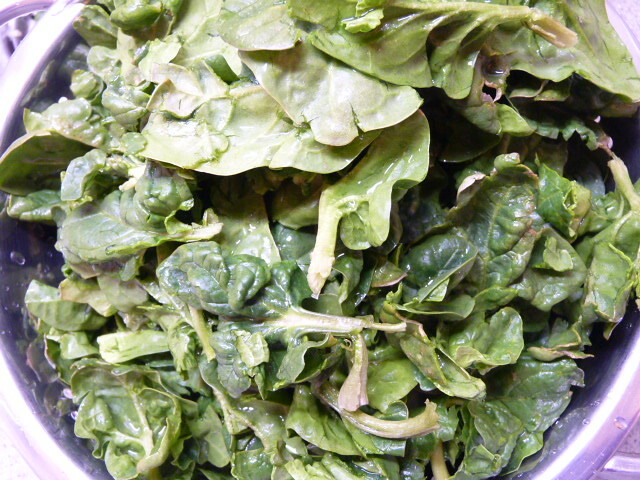 vitamin A, vitamin C, folate, and manganese. I came up with this recipe because I was determined to bring some bright flavor into our winter-weary home. And it worked! I’m very proud of this one – my “throw together pasta + some other stuff” attempts number in the hundreds, probably, but this might just be in my top five. It’s very frugal, too! Assemble the ingredients. 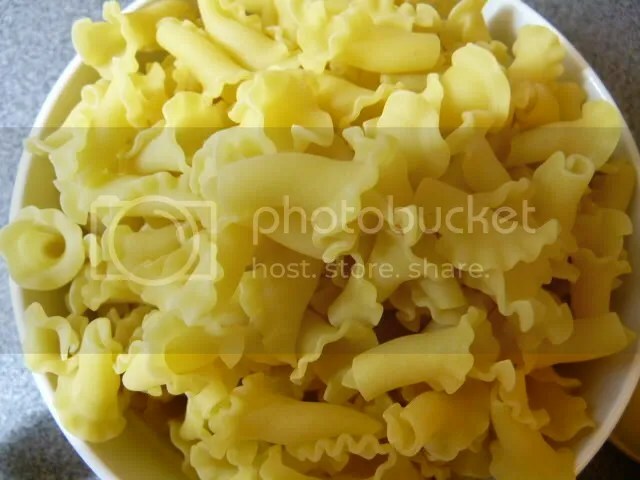 I’m using Greek kampanoules (little bells) pasta; Barilla sells this as ‘campanelle,’ but you can use any short cut pasta you like. Penne, rigatoni, or ziti would all work great here. 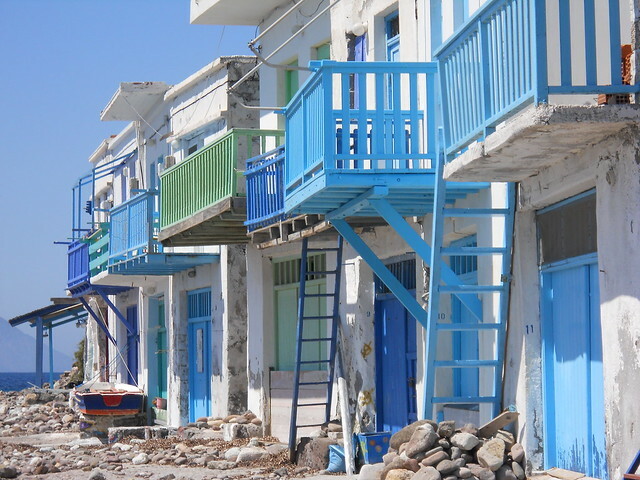 So would the Greek plexoudes. If you’re a regular reader, you know that meat is scarce in our house. Chorizo is one of my greatest frugal discoveries: I once spent an extended period of time reading the per kilo price labels on every single salami-type meat in the salami aisle and the deli counter, to find the cheapest one, at our local supermarket (Carrefour). 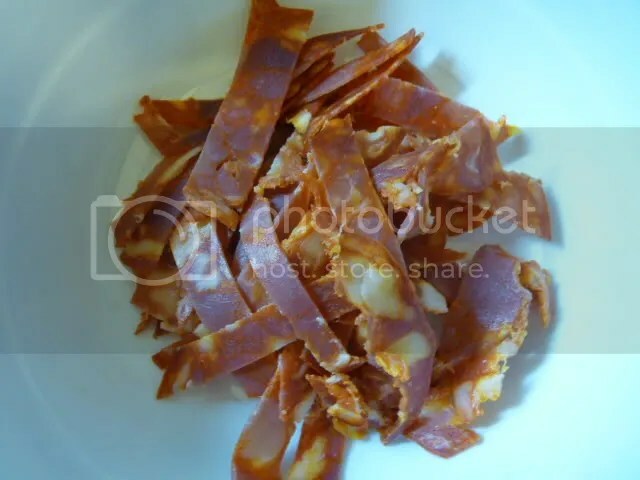 It turns out that Carrefour brand chorizo is actually the cheapest, tied with their storebrand plain salami. 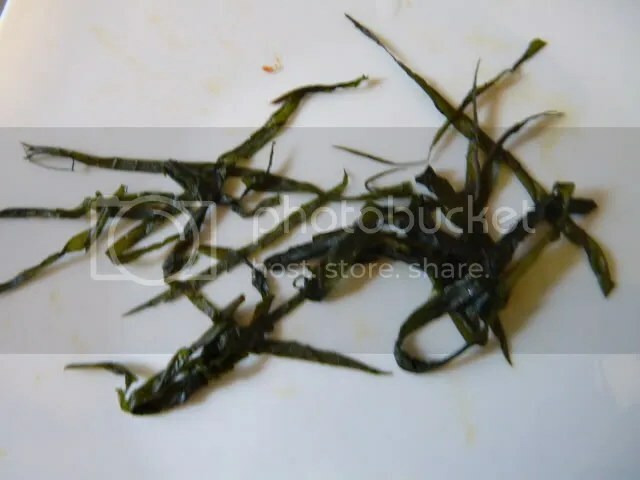 But it has so much more flavor – it’s spicy and very, very pretty, and only 1.72 for 150g, at least until the price goes up. The figs… these figs are absolutely delicious! 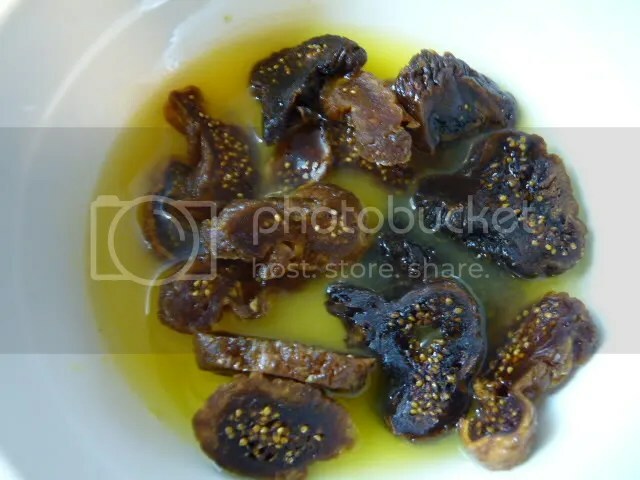 If you can, get partially rehydrated dried figs. 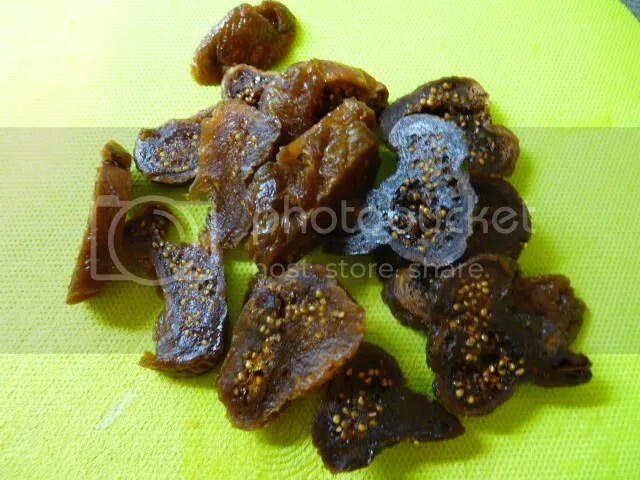 Regular dried figs are hard and rock-like; partially rehydrated ones are soft and mushy and oh so good! If you live in Greece, I like the Harmony brand. That mint came out of my freezer. I bought a bunch of mint last fall (my herb garden stayed on the island when we moved and I still haven’t restarted it… spring, where are you?) and froze most of it. 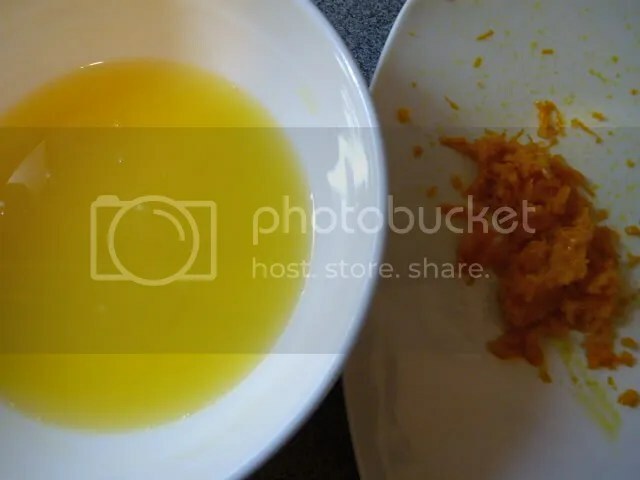 First, put some water on to boil; then zest the orange. Then juice it. Yes, I use a mechanical lemon squeezer to juice everything: lemons, limes, oranges, grapefruit. Anyone remember when those were all the rage? I think Crate & Barrel had them, and there was an orange one for oranges, the yellow one for lemons, and a green one for limes. Even back then I wasn’t silly enough to fall for that marketing trick! Cut the figs into slices. See how gooey they are? That’s because they’re partially rehydrated – woohoo! The figs go in the orange juice while everything else is happening. Isn’t this the most lovely combination of flavors? Slice the sweet potatoes, chorizo, and mint. When the water boils, put the pasta in. 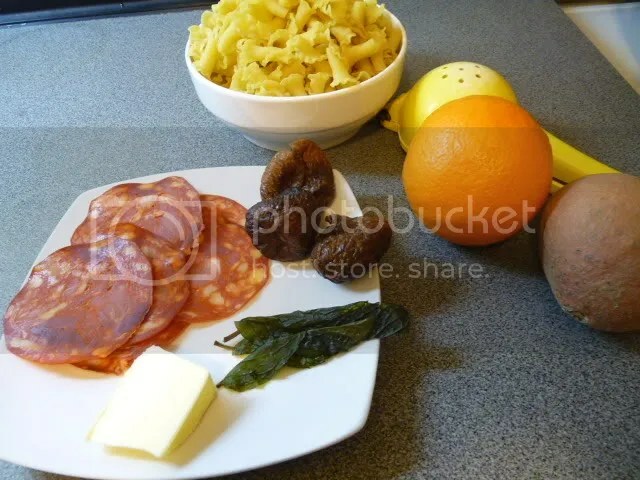 A few minutes before the pasta is finished, add the sweet potatoes to the pasta pot. 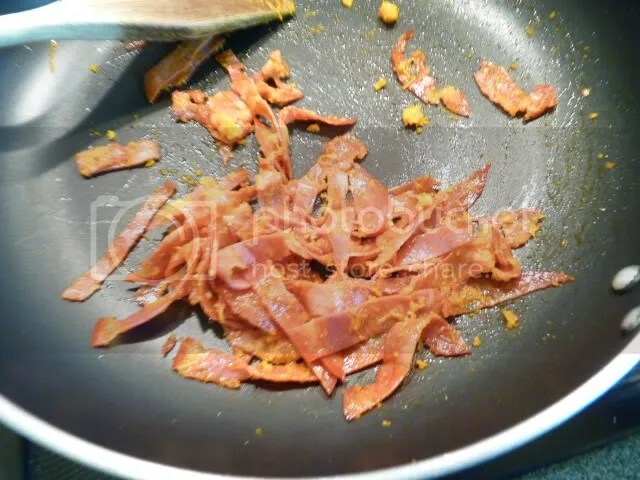 Heat up a nonstick pan and put the chorizo in; after a minute, add the orange zest. After another few minutes, add the figs with the orange juice. Strain the pasta and potatoes. 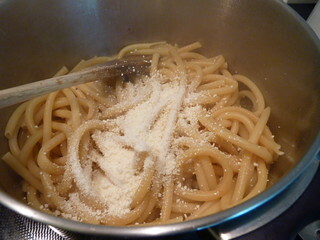 Add the pasta and potatoes to the pan, with the butter, and stir it all together until the butter is completely melted. 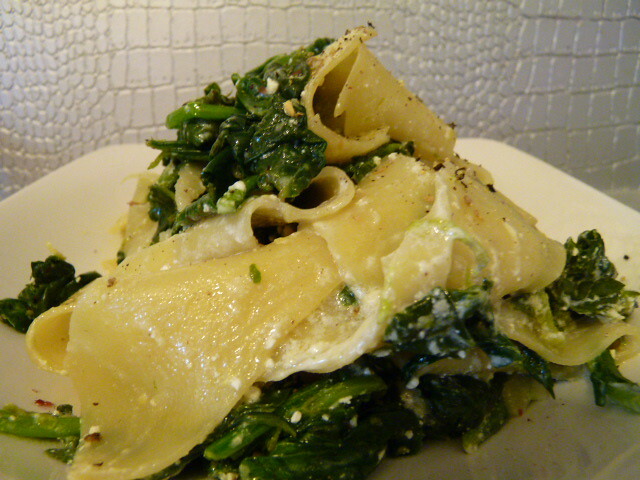 Serve with a few strips of mint on each plate. 1. Bring salted water to a boil and add pasta. 2. Zest and juice orange; slice figs; place fig slices in orange juice. 3. 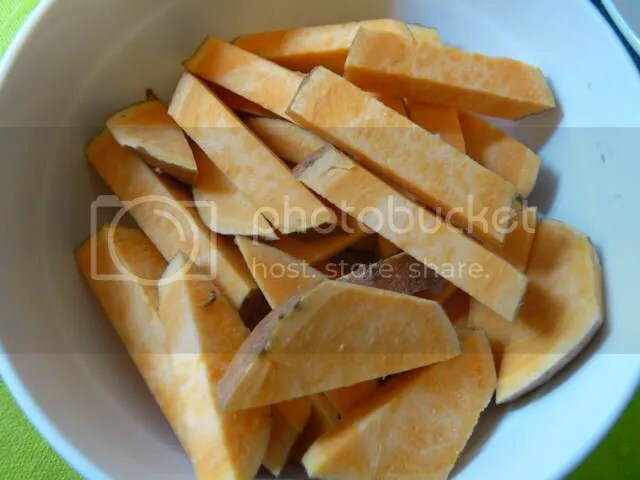 Slice sweetpotato into small sticks. 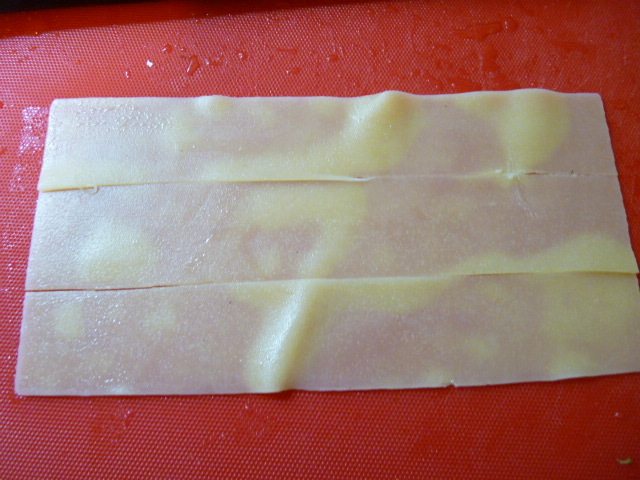 Slice chorizo into thin strips. Cut mint into very thin strips. 4. 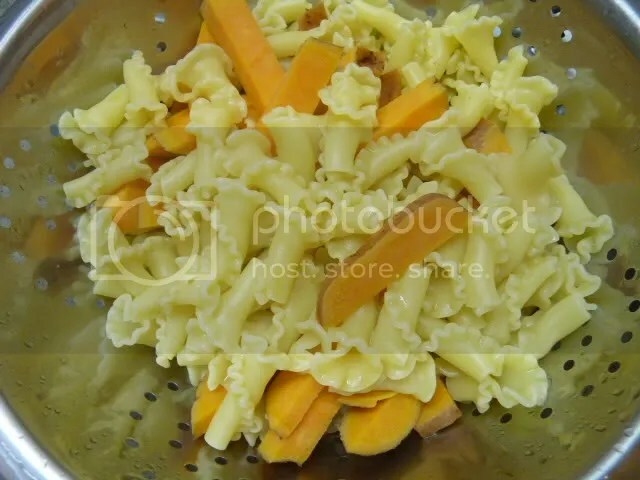 Three minutes before pasta reaches al dente stage, add sweetpotato to the pasta pot. When both are ready, strain. 5. Heat a nonstick skillet and saute chorizo without added fat. 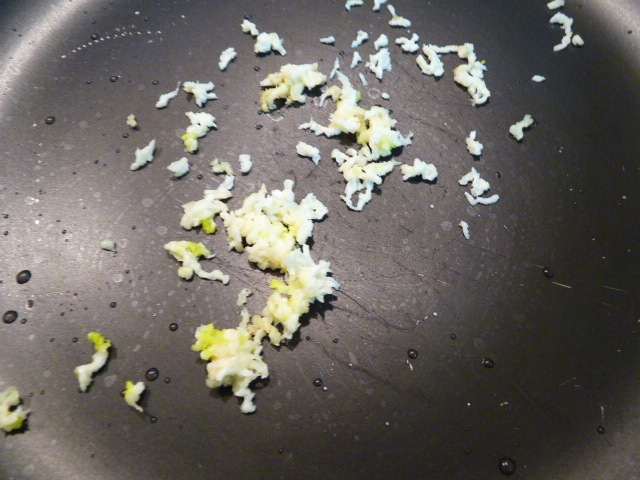 After a minute, add orange zest; stir constantly. 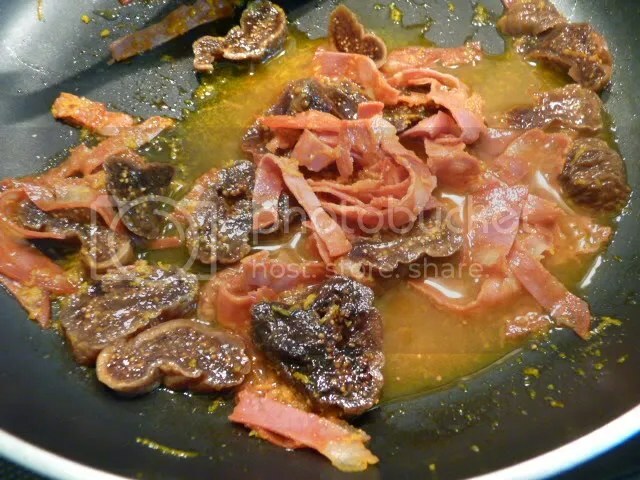 After another minute, add figs with orange juice. 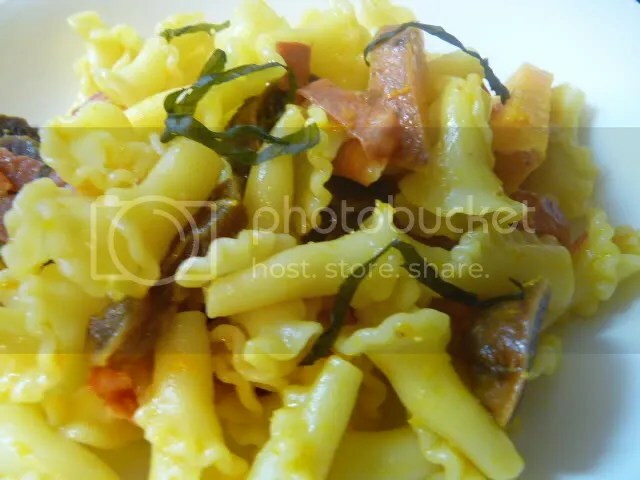 After 2 more minutes, add pasta and sweetpotato; and butter. Stir all together. 6. Serve topped with mint strips. Note: This is a quick recipe. 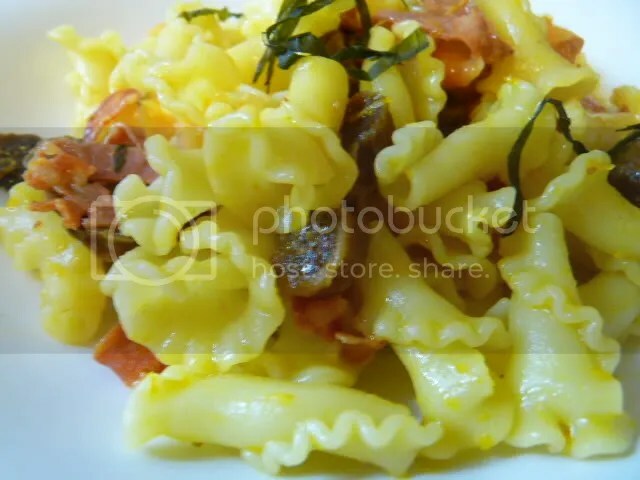 If you have time, however, instead of putting the sweetpotato in the pasta pot, roast it in the oven until soft. The flavor is better, but it takes longer and you have to burn electricity on the oven for one little sweetpotato, so I would only do that if I were already using the oven for something else. 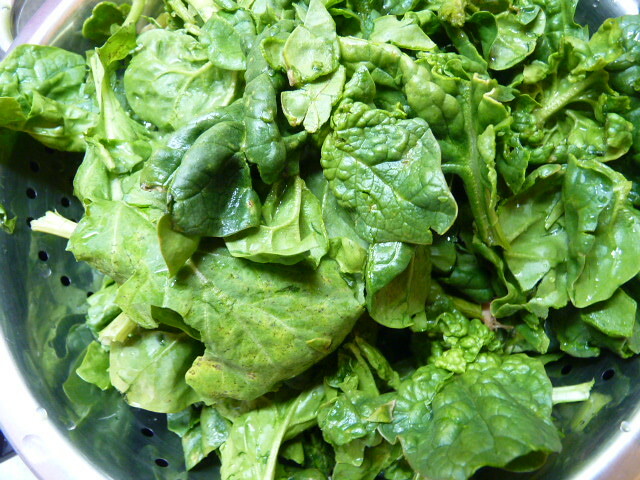 vitamin A, thiamin, niacin, phosphorus, selenium, magnesium, vitamin C, iron, riboflavin, folic acid, manganese, and copper.